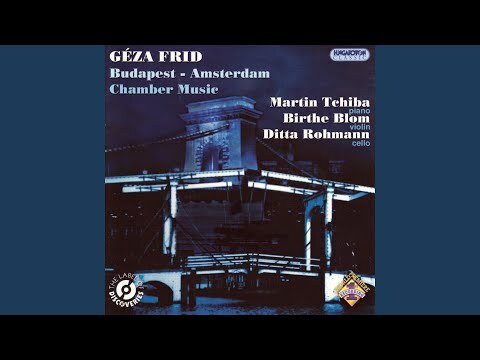 Géza Frid was born on January 25, 1904, in Máramarossziget, a small town in former Hungary (now Rumania). At the age of four, his mother gave him piano lessons, and later he went to the local music school. He had the ability to play by ear every piece of music he heard on the piano. As a seven-year-old prodigy, Géza gave his first concert. In 1913, the family moved to Budapest where he continued his piano studies at the Ferenc Liszt Academy of Music. In 1924, Frid graduated both in piano and composition. He owes a lot to his teachers Béla Bartók (piano) and Zoltán Kodály (composition). But not only because of the unique pedagogical qualities of these two celebrities. They supported him in his opposition against the Nazis and the anti-Semitic regime of Admiral Horthy. Already in 1921, a numerus clausus for Jews was imposed at the university. Because of the dictatorial regime and his desperately poor living conditions, Frid would soon leave his home country. But he maintained in close contact with Bartók and Kodály throughout their lifetimes. After a rehearsal of the Concertgebouw Orchestra, Frid presented the score of his first orchestral Suite to Pierre Monteux. The famous conductor responded enthusiastically, and premiered the piece in 1930 in Paris, with reprises in the Amsterdam Concertgebouw, and in New York's Carnegie Hall. Previously some friends had played a draft of his first string trio for Kodály, and Frid was relieved to hear Kodály's approval: “This piece is imprimatura” [can be published as is]. The Hungarian String Quartet from Budapest premiered his first String Quartet in 1927, and subsequently in several European cities. Thanks to these international triumphs as a composer, Frid received many invitations to perform as a pianist. Violinist Zoltán Székely, also from Hungary and married to a Dutch woman, encouraged Frid to emigrate to the Netherlands in 1927. Székely offered him the guest room in his home in Nijmegen, and a job as his accompanist. Frid grabbed this opportunity with both hands. Off to “a land of milk and honey,” as he imagined, “the land of freedom and justice, without acute financial difficulties, bedbugs and headaches.” For two years Székely and Frid collaborated intensively. During their successful concert tours in Europe, they created a network of contacts. Two highlights, however contrasting, were the encounters with Benito Mussolini and Maurice Ravel. Until the beginning of the war they frequently performed together, but soon thereafter, Székely and Frid went their separate ways. 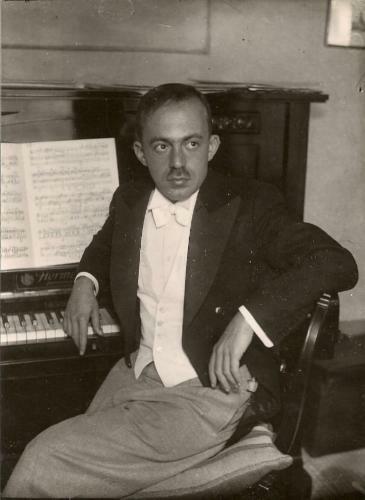 Between 1925 and 1940, Frid worked extensively with Béla Bartók. As a duo they performed music for two pianos and he was Bartók's assistant in folk music research. He also edited many of Bartók's manuscripts prior to publication, including masterpieces like The Miraculous Mandarin, Dance Suite and Cantata profana. Frid's Hungarian nightmare faded and life was going well for the prospective Dutchman. At that time, the cosmopolitan and genuine bachelor Frid, fell head over heals for Eylarda van Hall, a promising singer and pianist, and descendant from an old Dutch patrician family. They occasionally performed together, sometimes playing four-handed piano, and Frid as accompanist when Ella sang his songs. In 1937, ten years after his arrival in the Netherlands, they were married. Two years later - during the anxious Phoney War – their son, Arthur was born. They were overjoyed, as well as terrified. Fleeing was no longer possible. In late 1939, the Jewish musician, who had renounced his Hungarian nationality already before marriage, was a stateless citizen, and the young family had nowhere to go. After the outbreak of the war, Ella's cousin Gijs van Hall, the later mayor of Amsterdam, offered Frid a job as his assistant accountant to protect him from danger. Frid's last public concert was in the spring of 1941, together with Zoltán Székely, the man who brought him to the free world. Now, as a stateless Jew, Frid was condemned to his worst possible punishment: forbidden to work. The work and travel ban, and then, in May of 1942, the introduction of the Star of David. Endless card games with compatriots and companions in misfortunate. Gloom and fatalism. Arthur, their young son, found sanctuary at the home of Aryan family friends when the rumor spread that Seyss-Inquart also hunted half-Jews. Fear, hunger, cold. Yet Frid organized from late 1941 until the liberation nearly fifty clandestine concerts, at various homes. Literally for peanuts; the audience paid in kind: half a pack of butter, some flour, a box of matches. Frid was also active in the underground, as a forger of coupons and identity cards, and he participated in the artists' resistance movement. Miraculously he escaped detention and deportation from the Netherlands. In 1948, Géza Frid finally acquired Dutch citizenship. For him this was the symbolic relaunching of a wonderfully hectic and artistic life, more than he had hoped for. This gifted concert pianist quickly resumed his tours, also as accompanist and performer of chamber music. In 1948, he was the first Dutch musician to tour the Dutch East Indies, and in a two month period, he gave more than forty concerts and piano recitals. In the following years, his concert tours would take him to all corners of the world up until 1975. He performed with prominent soloists like singer Guus Hoekman and violinists Henryk Szering, Elise Cserfalvi, Jo Juda and Christiaan Bor. He formed a duo with pianist Luctor Ponse and was accompanist to soprano Erna Spoorenberg. Together they were the first Dutch musicians after World War II who toured the Soviet Union in 1963. Frid was active on other fronts as well. He was music editor for the newspaper Het Vrije Volk and head of the chamber music department at the Utrecht Conservatory. He held several management positions in the music world (among others at Buma, the Dutch agency of music copyrights), and he was the zealous promoter of the music of his teachers Bartók and Kodály. Two books and dozens of articles bear his name; about music, of course, but also on other art forms, on politics and literature. After the war Frid composed another eighty works. His varied oeuvre, a total of around hundred works, is not easily categorized. Its characteristics are the remarkable sense of rhythm, frequent use of contrasts and a melodic fantasy rooted in Hungarian folk music. His chamber music includes, five string quartets, and many violin and piano pieces. He composed orchestral works, opera and ballet music, vocal works, music for various wind instruments, etc... In his compositions – often commissioned – influences of Bartók, Debussy and Ravel are clearly audible. This is the account of a born musician, however, far less is known about the man Géza Frid. He was certainly not easy going, and equally hard to characterize. He was colorful, erudite, charisimatic and a bon vivant. A capricious genius, a potentate, a romantic, humoristic and wonderful father! His thirst for knowledge was coupled with a photographic memory. Interested in science, fascinated by aerospace and socially engaged. He read, with pleasure, the complete Encyclopedia Britannica, spoke seven languages and loved literature as well as sports. Géza Frid died on September 13, 1989, in the Dutch Burn Centre in Beverwijk, caused by a tragic accident in a nursing home in Bergen. Buried at Zorgvlied in Amsterdam, the city he made his home for more than half a century.